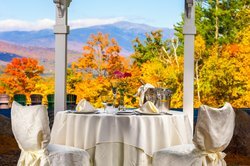 Our idyllic North Conway wedding venue in The White Mountains is the perfect spot for your special day, anytime of year! 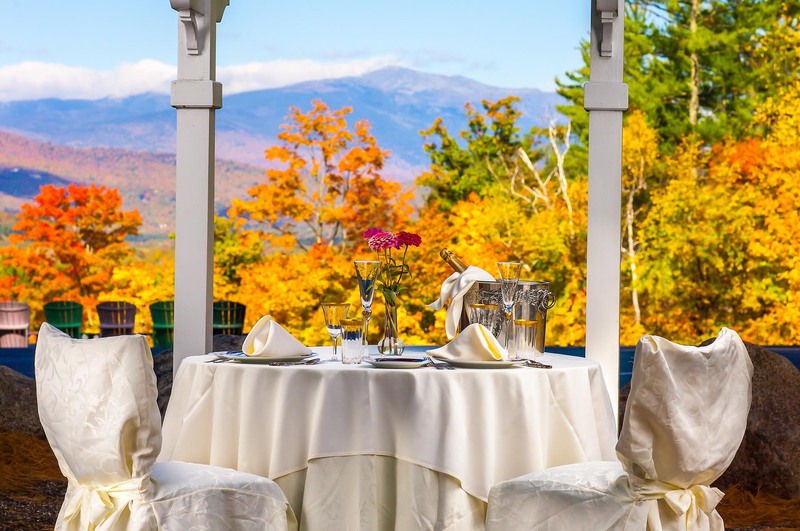 Stonehurst Manor’s 19th century style historical building creates an ambience of romance and glamour, and the stunning White Mountain backdrop is second to none. Our wedding coordinator works with each individual couple to customize their dream wedding and are pleased to consider special requests for menu concepts and other arrangements to ensure your dream wedding becomes a reality. While our inclusive wedding packages take the stress out of wedding planning so you can focus on enjoying your day. Say “I do” in front of up to 150 guests in our unique wedding garden with gorgeous mountain views, or by the rustic wood-burning fireplace in our oak-paneled Library Lounge. Outdoor tent weddings run from May to mid-October, while our dining room events take place from mid-October through April. After hosting a romantic wedding at Stonehurst Manor, newly married couples will enjoy a stay in one of our hotel’s spacious rooms. Our affordable New England hotel is ideal for a honeymoon or romantic getaway, with our unique, artfully designed guest rooms and comforting amenities. Couples love the secluded glamour that our hotel offers, while our luxurious amenities allow guests to feel pampered. We know that each couple has a different vision of their dream wedding, that’s why our New England wedding venue offers our guests a number of wedding packages that allow each couple to plan their special day. 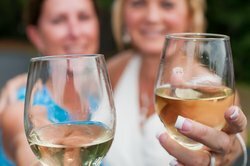 Our rehearsal dinner packages allow guests to take advantage of their romantic weekend with up to 42 guests. For more information on Stonehurst Manor wedding packages or to schedule a meeting, contact our on-site wedding coordinator Heidi Shellmer, at 800-525-9100 or 603-356-3113. Fill in our RFP form to reserve your NH wedding venue today! View our wedding gallery to discover more about Stonehurst Manor’s elegant weddings. Available from May to mid-October for 50 - 150 guests. MAY & JUNE - SAVE $5 pp for wedding booked any day in May or June or Sunday through Friday during other months. Holidays not included. SAVE $500 off your tent rental when your wedding is booked on Friday or Sunday. Tent weddings at Stonehurst Manor are held beneath an elegant white tent overlooking the Moat Mountain Range. You'll have ample space for entertainment and a bar. You'll also have use of our unique wedding garden, which looks out to Mt. Washington and is perfect for pictures. Ceremonies are planned for 12 noon, dinner will be served by 3:00 pm, and entertainment may continue until 7:00 pm. Tent wedding dinners must be served by 3:00 p.m. There is a Twenty-Three Hundred Dollar charge for your Tent, Tables, Chairs and Dance Floor. Save $500 when you schedule your wedding on Friday or Sunday! For complete details, pricing and menu, view our Classic Tent Wedding Menu as a PDF. You can have a tent wedding with a pizza buffet as well, and enjoy our signature wood fire oven pizzas cooked right here at Stonehurst. Weddings with 75 to 150 guests cost $43 per person, while weddings with 50 to 74 guests cost $48 per person. Available from mid-October to April for 50 - 150 guests. SAVE $5 per person for wedding booked any day in November or April or Sunday through Friday during other months. Holidays not included. We also host wedding receptions for up to 150 guests in our dining room from mid-October through April. Exchange vows in front of the wood-burning fireplace in our oak-paneled Library Lounge as your guests look on. Winter weddings in North Conway, NH can be very romantic. Ceremonies are planned for 12 noon, dinner will be served by 2:00 pm and entertainment may continue until 5:00 pm. Afternoon wedding dinners must be served by 2:00 p.m.
For complete details, pricing and menu, view our Romantic Afternoon Wedding Menu as a PDF. We also host small evening weddings for up to 28 guests. These weddings are available nightly, except Thursdays, Saturdays, and holidays. Ceremonies may be held between 4:00pm and 5:00pm. Use of the Wedding Garden, Gazebo, or Library Lounge for your ceremony is complimentary. View our Intimate Evening Wedding Menu as a PDF to learn more about services and dining during your ceremony. Host your rehearsal dinner for up to 42 guests. At $45 per guest, this includes your guests' choice of a five course dinner. There is also a $150 private dining room charge. The room charge is waived for Rehearsal Dinners if your wedding is held at Stonehurst Manor. 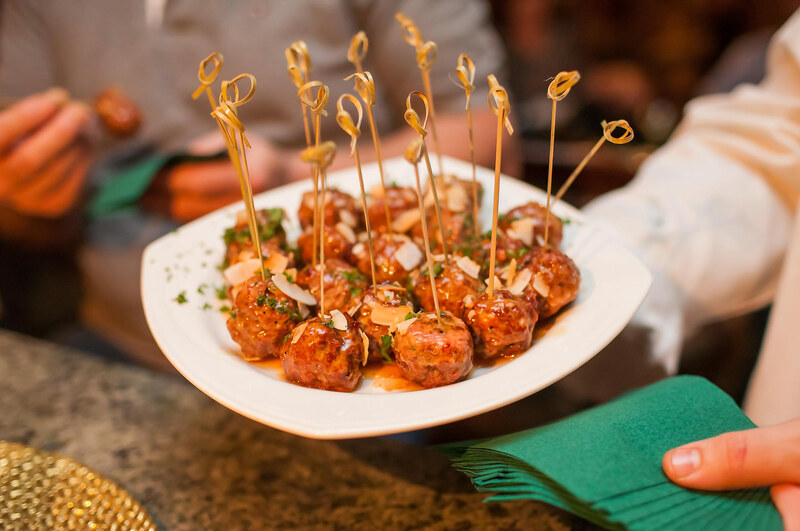 View our Rehearsal Dinner Menu as a PDF to see your guests' options. A selection of passed Hors d'Oeuvres and Cocktail Prices. View our Passed Hors D'Oeuvres & Cocktail Menu as a PDF. 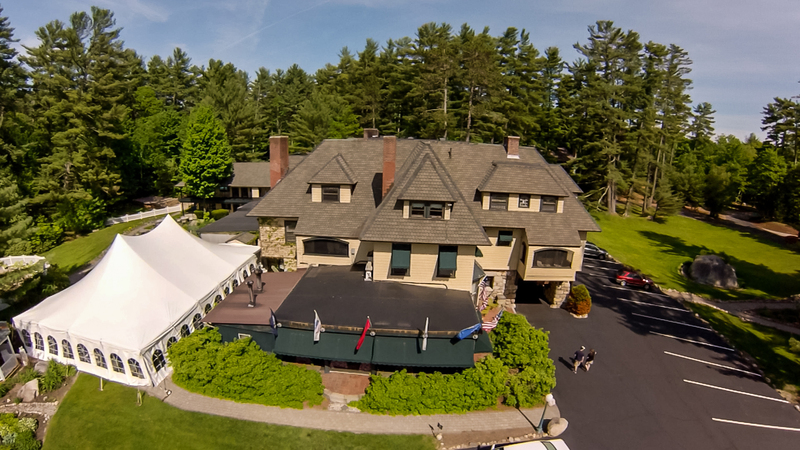 Whatever your New Hampshire wedding dreams are, we'll work to fulfill them at our New Hampshire wedding venue.